If you and your team are managing multiple creative projects per week (and many of you are managing more than six per week, in fact), having an effective review and approval process no longer qualifies as a “nice to have” - it’s a requirement. A well-defined review process helps to facilitate better feedback, improve turnaround times, and results in a higher quality finished product. Unfortunately, many creative production teams don’t have a proper review process in place. 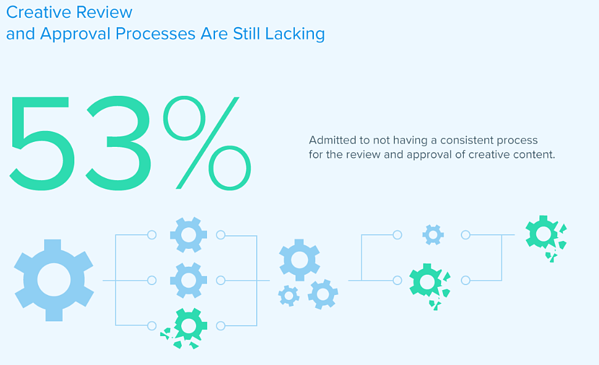 Did you know that 53% of marketing professionals admit (in a recent survey) to not having a consistent process for the review and approval of creative content? To understand whether or not your creative review process is healthy and to help you identify gaps in your creative process, it’s best to audit your review process regularly. Defining the overall process is critical, but operations and creative teams should also audit it regularly to ensure that it is being followed and optimized over time. First, How Do You Collect Specific and Contextual Feedback? One of the first areas to shine some light on is the feedback mechanisms for your review and approval process. How are stakeholders able to access the creative itself and leave relevant comments? Can stakeholders see comments that others have left? The ability to provide feedback and make revision requests are critical to the outcome of every project. In fact, it has the single biggest impact on delivery timelines. If you are still handling the feedback process through email, this is an immediate opportunity to improve. We’ve written before about email’s shortcoming as a feedback tool. It’s too easy for feedback handled through email to become disorganized and difficult to interpret and implement. Email chains can be split into multiple threads, stakeholders may provide feedback on the wrong version of the document, and generally, there isn’t an easy way for project managers and content creators to see all of the feedback in one central location. There are many alternatives to email as a feedback mechanism. The most obvious, purpose-built option would be an online proofing system. Depending on your existing investments, you may also look at other types of project collaboration tools. One key area to consider as you look at any solution is how it interacts with your existing toolsets. This will strengthen your review and approval process over time. Next, How Do You Facilitate External Feedback? Examine how your teams go about collecting external feedback for your creative projects. Is there a simple way to loop them into the process at the right time and allow them to see the other feedback that has been left for the project as well? 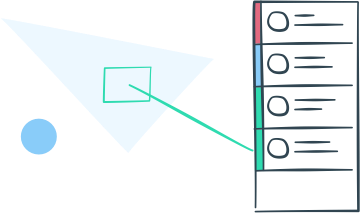 Also, when needed, are you able to segment feedback across versions and or review teams? Some internal conversations are best left internal. External feedback is critical for projects that require collaboration between organizations or teams and without a process in place for facilitating that feedback, you can’t be sure you are making the best possible use of your resources. Now that you’ve looked at the mechanisms and processes for feedback, let’s look downstream a little bit and consider the outcomes driven by that feedback, specifically how you iterate on your creative assets. What Determines the Creation of a New Version of an Asset for Review? Here’s an interesting stat: 83% of proofs projects created in Ziflow are approved on version 2. “Version sprawl” isn’t an uncommon occurrence with today’s busy marketing teams. If the aforementioned feedback processes aren’t buttoned up, designers are often left with the choice of cutting new versions as feedback trickles in (see the next section on the issues that itself can create). 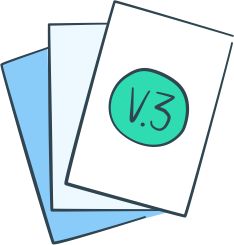 You’ll want to discover what the determining factors are for creating a new version to be shared for review. Is it triggered by a certain number of pieces of feedback? Or who is giving the feedback (stakeholder vs contributor)? This creates a nice segue to our next point. How Do You Manage Version Control in the Creative Process? We’ve discussed the importance that feedback plays in the creative process, as well as how that feedback is used to drive iterations (which often take shape as new versions) of projects. It’s important to then manage how those new iterations are shared and consumed. Simply stating that there is a new version for review of the asset is not enough.You have to have tools in place that help with version control to ensure that your teams are all now collaborating on the same asset. Additionally, your method of version control should allow you to easily navigate between versions of a specific piece of content. Ideally, you should be able to directly compare versions side-by-side to gain a deeper understanding of how the project has unfolded. Being able to look back and assess the changes that were made will not only help managers to decide when a new version of the document is necessary, but can also serve as excellent training materials for future projects. So, you’ve got to version two (or seven) and are ready to lock down a particular piece of creative. Now what? What is the Definition of “Done”? And Who Says So? Completing a creative project is no small feat. Given the various delivery channels needed, the inputs to be collected and the business objectives to be met, it’s a big undertaking. But when it comes time to approve the work and move to production, how is that handled? As simple as it sounds, many creative projects are left in an “in progress” limbo far longer than they should be, simply because decision making roles aren’t clearly defined. At the outset of an individual review process, roles should be clearly defined. Examples include “Decision/Approver”, “Reviewer”, “Viewer”, “Manager” (for those who need to manage the administration around the proof being reviewed), etc. Having these roles in place will also facilitate some of the upstream checkpoints such as new version creation. Key stakeholders should not only take an active role in providing feedback and steering the need for revisions and new versions, but also making decisions as to when an asset is approved and ready to move into production. Otherwise, it will often be left to assumption as to whether or not work continues on the asset. Having these details ironed out is critical to your creative projects, so that they aren't stuck in feedback limbo, constantly waiting for a new round of feedback that may not truly be necessary. Designing and executing a healthy creative review process requires that you take a good, hard look at your current processes to identify gaps and inefficiencies. A healthy review process includes well-defined guidelines for version control, stakeholder feedback, revision communication and ultimately final approval of a project. Once you have a healthy process, regular audits still need to take place to ensure that your processes are being followed and identify other areas for improvement.